The European Training and Research Centre for Human Rights and Democracy (ETC Graz) proudly hosts the Centre for the Promotion of Human Rights at the Local and Regional Levels. The Centre and the ETC closely cooperate in the fields of capacity-building on the local and regional levels all over the globe, human rights education, and research. The ETC was founded in Graz, Austria in 1999 with the concrete task of implementing the Graz human rights city process, and to foster human rights education. Current activities include research, education, trainings, and consulting. 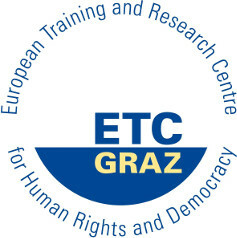 The ETC is engaged in questions of human rights enforcement and democracy in both a theoretical and a practical manner and works closely with local and European stakeholders, including the City of Graz, the UNESCO Chair in Human Rights at the University of Graz, the EU Fundamental Rights Agency, and the European Commission. Click here to get to the ETC Graz website.